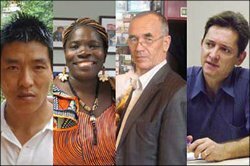 The Committee to Protect Journalists (CPJ.org), a New York based organisation, announced that it has given four journalists, who risked their lives and freedom, to talk about abuses of power and human rights violations in Brazil, China, Kyrgyzstan and Liberia, the 2012 International Press Freedom Award. The awardees are Mauri König (Gazeta do Povo, Brazil), Mae Azango (FrontPage Africa and New Narratives, Liberia), and jailed Tibetan documentary maker Dhondup Wangchen and imprisoned journalist Azimjon Askarov (Ferghana News and Golos Svobody), who have faced severe reprisals for their work, including assault, threats, and torture. The CPJ press release of 13 September 2012 says that Azimjon Askarov is serving a life term in prison in connection with his coverage of corruption by officials and Dhondup Wangchen is serving a six year prison sentence for releasing a documentary film to portray life in Tibet under Chinese rule. Azimjon Askarov, journalist and human rights defender, is an ethnic Uzbek from the Southern Kyrgyz town of Jalal-abad, who was sentenced to life in jail on 15 September 2010. He was detained three months earlier on suspicion of organising mass disturbances during the tragic events in Southern Kyrgyzstan and charged with complicity in a police officer’s murder. Mr Askarov really was in Bazar Korgon at the time and even tried to document the events, seeing it as his duty as a defender of human rights. The investigation of his case was marred by violations. Mr Askarov was tortured and humiliated, and according lawyers and international observers, there was no material evidence of the defendant’s guilt presented at the trial. Local human rights defenders and friends of Mr Askarov are certain that the court is unjust and looks more like vengeance by law-enforcement agencies. It should be noticed that the police has harboured a grudge against Mr Askarov for a long time. During the President Kurmanbek Bakiyev’s rule (2005 – 2010) the human rights defender seriously annoyed the justice system by acting for the victims of police and court abuses. The awards will be presented on November 20, 2012 in New York at the annual Committee to Protect Journalists awards dinner. Azimjon Askarov and Tibetan Dhondup Wangchen will receive their prizes in absentia. Final report on Bazar-Korgon case. International pacts, Kyrgyz constitution and legal code violated.